Avon Fire Authority has unanimously approved the new Service Plan for Avon Fire and Rescue Service (AF&RS), which outlines how the Service will to use its resources to help protect the public for the future. All fire and rescue services across the country are required to have an Integrated Risk Management Plan (IRMP) which assesses local and national risk and states the services’ commitment to saving lives, improving public safety and reducing emergency incidents. AF&RS’ new Service Plan, which was passed by the Authority at their latest Fire Authority meeting (26/03), outlines how the Service will be preventing, protecting and responding to the needs and building the resilience of its local communities. Following an eight week consultation period, which saw over 170 people have their say, amends have been made to the draft Service Plan taking account of the feedback received during the process. These amends include those made to the response standards and automatic fire alarms (AFAs). Similar to the draft Service Plan, AF&RS will still set a standard of eight minutes for the average response to emergency critical incidents from when the station is alerted to when crews arrive on scene. However, an amendment will see AF&RS also monitor the attendance times of the second, and when applicable, third fire engine mobilised to all incidents. This will be reported to the Fire Authority on a quarterly basis, via the Performance Review and Scrutiny Committee. Secondly, with AFAs at sleeping risk and high-risk premises where call challenging fails, the Service will deploy two fire engines between 21:00 and 06:00, as opposed to the one fire engine deployed between the hours of 06:00 and 21:00. Mick Crennell, Chief Fire Officer for AF&RS, said: “We are delighted the Fire Authority have approved and passed our new Service Plan, meaning the Service can move forward in continuing to provide an outstanding service that our staff and local people can be proud of. “The Service Plan will come into effect from April 1st and provides us with the strategic direction to ensure our hard work continues to make our communities safer and make our Service stronger. “Reducing the high level of false alarm calls will free up a large drain on our resources, taking firefighters away from lifesaving activities or risk reduction work in the community. Our risk analysis showed that we had to develop new ways of working to ensure that we provided a first-class emergency service. “Thanks to the extensive and hard work of everyone involved, our proposals were ambitious and transparent and it is clear that the public and Fire Authority agreed. 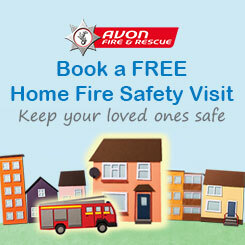 Councillor Donald Davies, Chair of Avon Fire Authority, added: “As an Authority, we are responsible for ensuring Avon Fire & Rescue Service provide the community with information and fire safety advice, keep our roads safer and offer an effective response to emergencies across the area. “In the demanding financial and political climate we continue to face, this Service Plan does exactly that and we are glad that our communities had a say in it. “It is important that as an organisation, we are transparent, honest and ambitious about the direction we are headed. Our strategic approach over the next three years. Changes to our response standards from a model based on population density to matching our response to the level of risk people face. Changes how we respond to automatic fire alarms. This would mean higher risk premises would still receive a proportionate response but high-frequency calls to alarms in low-risk premises would not continue to receive an automatic response. This will serve to ease organisational demand and allow our staff to maintain their focus on prevention, protection and risk-critical training activities. AF&RS produced a YouTube video which has to date had 169 views. AF&RS received a total of 4,024 page views on both Service Plan articles during the consultation.